The Subversive Archaeologist: Can You Say Reprehensible? I suppose it'll come as a shock to no one. The leading source of business news for the 1%, the Wall Street Journal, ran a story recently about TEFAF, the annual fine art and antique fair in the Dutch city of Maastricht that's put on by the watchdogs of art on 'the continent,' The European Fine Art Foundation. I'm singling out for deprecation the TEFAF, its exhibitors/dealers, and the WSJ reporter because of the kind of 'art' that it and the paper are pimping. 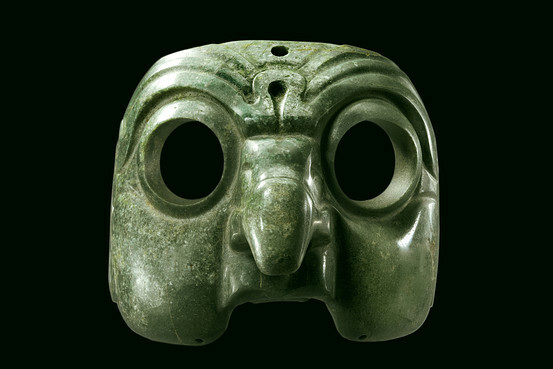 I was drawn to the article by a link somewhere that showed this (putatively) Olmec jade mask [clearly meant to be worn by its two-legged primate carver or the owner thereof] and proclaimed that it had been sold for €1.75 million (a lot of money). All of my archaeologist friends will cringe at the thought, to begin with. But if they're like me, the cringe will transform itself rapidly into closed fists and rage. This is how one 'dealer' explained his situation vis a vis the Olmec mask. Meanwhile, ... a powerful, life-size mask in blue-green jade by the Olmec people of Guatemala in 900-300 B.C. captures the eye. Representing an owl man, the haunting, supernatural creature has both human and bird-like features... . "We waited hopefully for ages before contemporary collectors moved into our market," says Bobbie Entwistle." And then it happened in the last three years." Her partner, Lance Entwistle, notes that pieces at the high-end are doing particularly well, as big contemporary art collectors seek iconic objects. "Unfortunately," he says, "supply is short." Boo-hoo. Bastards. If the pillage of archaeological sites weren't already a bigger threat to world heritage than the government of Turkey, sales and prices like this'll quickly turn the trade of illegal antiquities into a global turf war for plundering rights. And you thought cocaine was troublesome! Only two WSJ readers commented on this travesty of a 'news' story. One brought up the difficulty of authenticating such pieces. True. If there were any real authenticating going on, the dealers must be in possession of the lay equivalent of a chain of evidence going right back to the impoverished, machete-wielding opportunist who hacked a chunk of our heritage from its archaeological context. If so, it should be possible for law enforcement to bring charges of illegal trade in antiquities against each and every pair of hands that touched that piece, all the way back to the Mexican bush-whacker. Wouldn't it be loverly? It goes without sayin' that it ain't gonna happen. Finally, how oblivious to the ongoing archaeological Armageddon was our thoroughly, editorially ethical, WSJ correspondent? This is how. Among my favorites were Egyptian pieces. At Rupert Wace Ancient Art of London, a rare Egyptian relief with an image of Queen Hatshepsut, who was the first woman to rule Egypt in her own right (1479-1458 B.C. ), was quickly snapped up for a six-figure sum. "From the first day, we had lots of sales," says Swiss ancient-art dealer Jean-David Cahn. Among the pieces that went immediately were a small head of a bald Egyptian priest, from 728-525 B.C. (price: €62,900); and an exquisite, serpent-shaped, gold Egyptian bracelet, from the second century B.C. (price: €29,600). Such bracelets decorated the upper arm of Hellenistic statues of Aphrodite in Alexandria. To summarize, Jeebuz! We're all in trouble with this much slam-dunk ignorance and avarice abroad in the world.